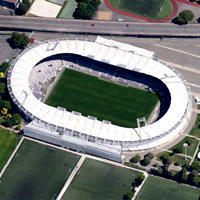 Planned expansion of Stadium de Toulouse was supposed to bring its capacity to over 40,000 ahead of Euro 2016. However, the municipality decided to downscale the plans, dropping the extra seated tier and thus not expanding the stadium at all. On the contrary, capacity will even fall by 2,500, from 35,575 to 33,150. This will mostly be the outcome of end stands being reconfigured from curved athletics mode to more football-specific alignment. Works estimated at €41.5 million over 3 years are expected to start in June. First stage, lasting until May 2014, will see the east end and half of northern stand being reconfigured. Similar thing will be done to the other half of northern stand and west end in May 2014 – February 2015. In the meantime, between two seasons, new pitch will be laid in the summer of 2014. Finally, between February and October 2015 the last stand – southern one – will get its overhaul, lighting is to be improved to reach HD quality and facades are to be renewed. Throughout the works, pictured below, at least 22,000 seats are to be made available.